Remembering before our God and Father your work of faith and labor of love and steadfastness of hope in our Lord Jesus Christ (1 Thess. 1:3). First Thessalonians was written to people who were facing adversity (specifically persecution). We all need a source of hope, especially during times of adversity. The church in Thessalonica began as a result of Paul’s preaching of the gospel (1:4) during his second missionary journey (Acts 17:1-9). The Thessalonians had “turned to God from idols to serve the living and true God” (1:9). They possessed a new hope—a hope that would be fulfilled at the second coming of Jesus. The second coming is mentioned in every chapter of 1 Thessalonians (1:10; 2:19; 3:13; 4:13-18; 5:1-11, 23). When Paul uses the word “hope,” he’s talking about something that’s an “absolute certainty,”  not something that’s based on wishful thinking. Our hope is “in our Lord Jesus Christ” (1:3). It will be fulfilled when Jesus returns. This hope gives us “steadfastness” (i.e., endurance). When we face adversity, there’s the temptation to give up. Our hope in Jesus gives us endurance during times of adversity. Like the Thessalonians, we “wait for [God’s] Son from heaven, whom he raised from the dead, Jesus who delivered us from the wrath to come” (1:10). “Wrath” refers to God’s anger over humanity’s sin. Jesus not only a Saviour; he’s also a Judge. “Whoever believes in the Son has eternal life; whoever does not obey the Son shall not see life, but the wrath of God remains on him” (John 3:36). But God’s love is seen in what he did to remove his wrath from us: “God so loved the world that he gave his only Son, that whoever believes in him should not perish but have eternal life” (John 3:16). 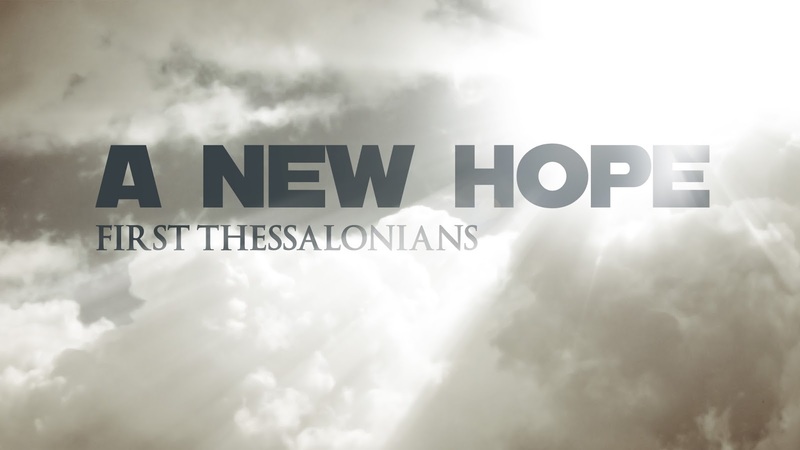 The Thessalonians were confused about some details concerning the second coming (4:13-18; 5:1-11), but their hope was solid. Today, Christians don't all share the same views on the second coming (e.g., its timing), but we all believe Jesus is returning. Let's not make this into a divisive doctrine. We have one hope. Silvanus and Timothy are also mentions as senders of the letter. They had been coworkers with Paul during his second missionary journey when the Thessalonian church was planted. Thessalonica was located in Macedonia. When 1 Thessalonians was written, the city had a population of over 100,000 people. Gordon D. Fee, The First and Second Letters to the Thessalonians (NICNT), 5. Gene L. Green, The Letters to the Thessalonians (PNTC), 89. These three virtues are found together elsewhere in the NT (Rom. 5:1-5; 1 Cor. 13:13; Gal. 5:5-6; Col. 1:4-5; 1 Peter 1:21-22; Heb. 10:22-24). Gary S. Shogren, 1 & 2 Thessalonians (ZECNT), 59.